Compare traditional daylighting methodologies and automated shading systems in their ability to maximize daylight exposure in a space and control glare. Describe how automated shading and lighting control systems work together to execute daylighting and daylight harvesting strategies in a workspace, maintaining an optimal visual environment, improving occupant comfort, and saving energy. 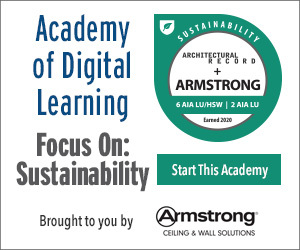 Explain the daily functionality of the automated shading and lighting system in the new York times Building and how the dynamic nature of the control has resulted in impressive energy savings. Select daylighting systems that can maximize the amount of glare-free daylight exposure. Automation may be considered one of the hallmarks of the 21st century. Voice recognition software, ATMs, e-commerce, and airport kiosks are just a few examples of the automated solutions that have already become commonplace. People are increasingly interfacing with machines in the pursuit of improved productivity and efficiency in their daily and professional lives, happily relegating some routine action items to new automated resources. Buildings are becoming increasingly more automated too. The 21st century demands that the built environment become more economical, more environmentally friendly, and more comfortable for the occupants and employees within. It has been proven that incorporating daylight into the interior, a practice referred to as daylighting, can advance all three legs of that agenda. When daylight is present, electric lights can be dimmed or turned off, dramatically reducing the lighting costs. Consuming less energy reduces the overall carbon footprint of the building, and studies have shown that people have a positive response to daylight and views of the outside, improving their productivity, workplace satisfaction, and morale. The only drawback to daylight is that the sun is a dynamic light source that requires constant attention and most people do not have the time and resources to actively manage it. Walking around a building, it is not unusual to see manual shades that have been pulled down weeks before to block intense early morning light, but are now keeping soft, ambient afternoon light out as well. The management of daylight seems like the perfect candidate for automation. Automated shading and lighting control systems offer specifiers a dynamic daylighting solution that readily adjusts to custom fit the microclimate of any building, without active oversight by personnel. These systems are cutting-edge in their ability to optimize a building's use of and response to the sun. They can predict and respond to cloudy or clear sky conditions, maximizing the diffuse daylight allowed into the space and actively defending the interior from distracting direct sunlight. A combination of daylight control (shading) and electric lighting control systems equips specifiers with a tool to maximize the collaboration between these two types of light, improving efficiency and the ability to control the complete visual environment. Automated shades are affordable and have cost-effective return on investment (ROI) considering all their benefits. 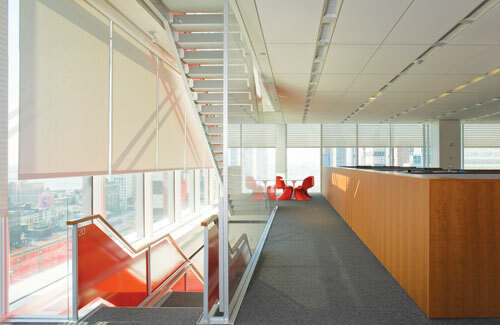 Automated shading and light systems continuously manage the presence of daylight in the workspace to improve occupant comfort and create energy savings, as in The New York Times Building, New York City.